Paul Revere's Ride - the Real Story! Paul Revere's Ride, by Henry Wadsworth Longfellow is a poem known by generations of American school children. The views many Americans hold about Paul Revere are derived from this poem, which was written in 1861, more than 40 years after Revere's death. The poem was actually written at the outbreak of the Civil War, when many writers were trying to rally Northerners to fight against the South. Longfellow succeeded in stirring up the spirit of many Northerners with this poem, rallying them around the idea that one person could take a bold stand for his country and make a difference. Revere was only a regionally known person until the publishing of this famous poem, which turned him into a beloved national folk hero. The poem however, was not meant as an historical account of the famous midnight ride and it contains many inaccuracies. This article will clear up some of the inaccuracies and tell you what really happened on Paul Revere's Ride. You can also read Paul Revere's personal account of his ride here. 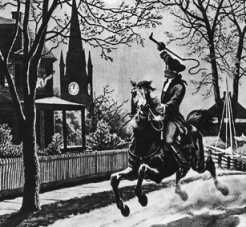 First of all, Paul Revere's ride of April 18, 1775 to Lexington was not his first ride to Lexington. Actually, he had made the same trip two days before to inform John Hancock and Samuel Adams and the Provincial Congress, which was then meeting at Concord, near Lexington, of the most recent events in Boston. Through the efforts of the patriots' intelligence network, they believed that a British assault against the colonists arms cache at Concord was inevitable, as well as an attempt to capture the leaders of the rebellion, specifically Hancock and Adams. Paul Revere was sent to warn them of the impending assault so they would be prepared. 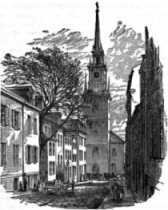 On the same day, Paul Revere instructed his friend Robert Newman, who was the sexton of the Old North Church in Boston, to send a signal to the patriots across the river in Charlestown by putting one or two lanterns in the steeple of the church, and informed his friends in Charlestown of the plan. One lantern meant the British would be moving by land south of town, and two lanterns meant they were crossing the river north of town. Revere set up this signal to notify Charlestown of the British movements, intending that the citizens there should take on the mission of informing the countryside in case the riders failed to get through. Paul Revere was also not the only messenger sent to warn the patriots of the impending British advance. The leaders in Boston actually sent two messengers, just in case one of them was captured. The second messenger sent was William Dawes. Revere was sent across the Charles River north of Boston, and Dawes went by land south of Boston. The Longfellow poem depicts Paul Revere as the only rider that night, and depicts the lantern message as being for Paul Revere, to inform him of the chosen route by the British, instead of being from him to the citizens of Charlestown, to inform them that the British were coming, in case he did not get through. The poem also has Revere arriving in Concord to warn the citizens there of the march of the British, but in reality, he delivered the message only as far as Lexington, he was caught by a British patrol before ever arriving in Concord. On the night of April 18, 1775, the patriots in Boston became aware that the British troops were beginning to move. Dr. Joseph Warren gave Paul Revere the orders to warn Hancock and Adams in Lexington, as well as to notify the patriots along the way that the British troops were coming. First, Paul Revere instructed Robert Newman to put up two lanterns in the Old North Church per the prearranged signal, notifying Charlestown that the British were taking the sea route. After this, he left on his mission about 11 pm that night. He was rowed across the river in the dark of night by two friends, Joshua Bentley, who was a boat builder and Thomas Richardson, a shipwright. On the other side, in Charlestown, he borrowed a horse from John Larkin, Deacon of the Old North Church. It is a common question for people to ask the name of Paul Revere's horse. The name? Brown Beauty. While in Charlestown, Revere was warned by Richard Devens that he had met 10 heavily armed British soldiers going up the Lexington Road earlier that night. Shortly after leaving Charlestown, Revere spotted two British soldiers on horseback under a tree in the road ahead. They tried to apprehend him but he got away. One of them got stuck in the mud and the other tried to get in front of him by taking a different route, but Revere was able to avoid him. Paul Revere's route took him through Somerville, Medford and Arlington. Along the way he warned patriots that the British regulars were on their way so they could prepare for armed battle. The poem Paul Revere's Ride, says that as he rode, Paul Revere yelled out, "The British are coming!" In truth, he actually yelled, "The regulars are coming out!" This is known from eyewitness accounts and from Revere's own account of the ride. As Revere and Dawes delivered their warnings along the road to Lexington, many other riders left on missions to warn others in the area. Perhaps as many as 40 riders went out that night. Paul Revere arrived in Lexington around midnight (the poem has him arriving triumphantly in Concord!) and delivered his message of warning to John Hancock and Samuel Adams. William Dawes arrived about a half hour later. They stayed in Lexington for some time discussing what to do with Hancock and Adams. Eventually, Revere and Dawes, along with Dr. Samuel Prescott, decided to ride on to Concord to warn the patriots there. Shortly after leaving Lexington, they were stopped at a British roadblock. These were the same soldiers that Richard Devens had warned Revere about earlier that night. Prescott escaped and warned the citizens of Concord, who then successfully repelled the British. They had already got the ammunition out of town anyway when Revere warned them two days before. Dawes escaped and returned toward Lexington, but fell off his horse and wasn't able to complete the mission. Paul Revere was captured and questioned. He was led at gunpoint back to Lexington. 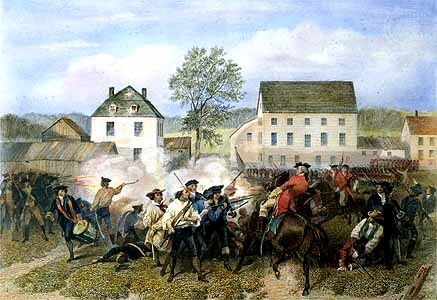 As the patrol escorting him arrived in Lexington, gunshots were heard coming from the town, where the Battle of Lexington Green had begun. The British regulars took Revere's horse and went to town, leaving Revere alone. He walked into town and found John Hancock still at the Hancock-Clarke house, the home of Reverend Jonas Clarke. Revere helped Hancock and his family escape with their belongings, including a trunk of incriminating papers, which he and John Lowell retrieved from a local tavern as the muskets roared outside on Lexington Green. Revere was not a nationally known figure for his actions that night in his lifetime. He did not become a national folk hero until the publication of Longfellow's poem. It is sure however, that his actions, along with those of William Dawes, Samuel Prescott and the other unknown riders that night prevented the British from capturing two key patriot leaders and a large supply of the patriots' ammunition in the opening battles of the Revolutionary War. 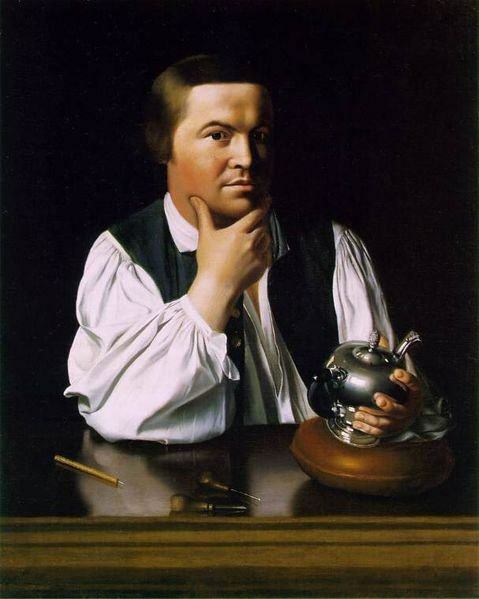 Read a list of interesting Facts on Paul Revere.